Among the hundreds of uses to which such tubes have been, or could be, put, a few are: watching a machine in a factory, a flame under a boiler and a water gauge at the top of a giant boiler. They also guard prison corridors, or keep an eye on a jewelry counter in a store. They can be used to check progress along an assembly line, or the density of traffic at critical intersections. One operator, one guard, or one production manager can perform the work of a dozen or more men. Its relationship to labor will be even more complicated to resolve. How many pairs of human eyes these tiny TV tubes can replace, nobody has even tried to estimate â€” but coupled with the incredibly skillful automatic devices already speeding production in American industry â€” they are something to reckon with. One use for this wired TV will meet with no opposition from anybody. In perfect safety, operators can now watch remote-control manipulations in areas filled with radioactivity. They also can observe critical blending of unstable chemicals and get a good close-up of the blast from an experimental jet or rocket. Sealed in a container with a suitable light source, it can report on the underwater damage to a ship’s hull, or help in salvage operations. In some situations camera units are expendable, and in years to come this device is destined to save many lives. A good number are already at work in atomic-energy plants, and other defense projects shrouded under security regulations. Probably the “oldest” installations in continuous service are those of the four Utiliscopes which the New York Edison Company uses to check on the water level in some of its five-story steam boilers. For four years now, two or more of these little TV eyes have been at work 24 hours a day watching the gauges which indicate the water level in drums at the top of the boilers. This information is relayed to the main control panels on the ground floor. A pressure of 1400 pounds to the square inch, and a temperature of 900 degrees require special mica-coated glass one inch thickâ€”and even this blows out from time to timeâ€”so that watching these gauges can be dangerous. Another early application of the Utili-scope was in strip coal mining. It was discovered that in operating a power shovel capable of picking up 40 tons in one load, the operator had no direct view of the scoop. Frequently, he came up with half loads, which resulted in a loss, as the shovel was very costly to operate. A TV camera installed on the upper rim of the shovel, with the receiver in the operator’s cab, gave him a clear picture of exactly how much material he had picked up. Still another use of the Utiliscope is in the steel industry, in the B & W Tube Works, of Beaver Falls, Pa. Here a camera equipped with a telephoto lens is used to watch the surface of molten metal in a continuous casting process. This eliminates the need of a man standing close to the casting pipe. While standard broadcast television has about 525 scanning lines, the Utiliscope picture has but 220 lines. The resulting picture is not quite as clear as that on your home set, but is entirely adequate for the vast majority of industrial applications, and cameras and viewers can be connected with ordinary cables instead of coaxials. The picture will carry about 500 feet without booster equipment, farther with it, and as many as 10 viewers can be connected with one camera. The total cost of one complete Utiliscope installation is between $3000 and $3500. 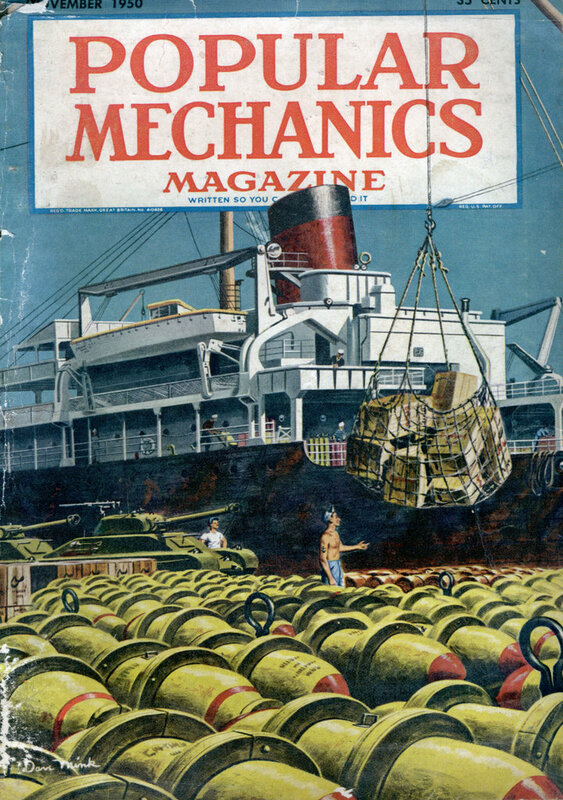 Remington Rand’s Vericon, developed under William L. Norvell, chief of the Guided Missiles Branch in Air Communications as a lieutenant colonel during the war,has found its chief uses so far in military and defense plants, and the observing of surgical operations. The Vericon uses a standard 525-scanning-line picture and a coaxial cable. A complete unit runs to about $8500. More than a score of Army ordnance depots around the country are also equipped with these little TV eyes to make the defusing and disassembling of various types of ammunition safer. Personnel located in a concrete bunker half a mile away can defuse a bomb by means of a power-operated wrench, watching the progress of the work in their viewer. RCA’s Vidicon, also using a 525-scanning-line picture and a coaxial, is just out of the laboratory and has had few installations as yet. The tube is but one inch in diameter, and its housing measures only 3-1/2 by 5 by 10 inches, making it unusually compact. It is expected that this device will find many jobs in industry in the inspection of small or inaccessible spaces, such as cylinder or cannon bores, the interior of factory chimneys, grain elevators, or the joints in oil-well casings. A bank in Texas is installing equipment so that checks and other documents presented at windows in its main banking floor can be inspected on screens in upstairs offices. Department stores could install screens in street windows or booths on the first floor, so that passers-by could see a fashion show or some other special event, such as Santa Claus, on an upper floor. One watchman with an eye on a central control board, could cover 20 or more check points in a factory, or in a series of buildings. Automatic panning devices, similar to those which swing electric fans in wide arcs, could enable each camera to cover two or more corridors. The Utiliscope, which is sensitive to infrared illumination, could spot intruders even though they were apparently operating in total darkness. Undoubtedly, the FBI and other detection agencies will make great use of this device in the near future. In psychiatry, too, it has been suggested, students in one room could watch the reactions of a patient being treated in another room, without his being disturbed by their presence. Traffic-control officers and highway, bridge and tunnel officials could get a clear picture of traffic jams in the process of forming by watching the flow of vehicles at critical points in a central control room, and then directing motorists to detours and alternate routes, through traffic officers. One project at present under consideration by a major motor manufacturer, would place cameras at key points on the subassembly lines feeding into the main assembly. Thus an engineer watching the progress of work on a dozen smaller lines, could spot a bottleneck before it developed, and do something about it. Hooked up to a microscope, such a small TV unit would enable a whole class of students to watch a demonstration by an instructor. Several receiving sets could be placed around the classroom. 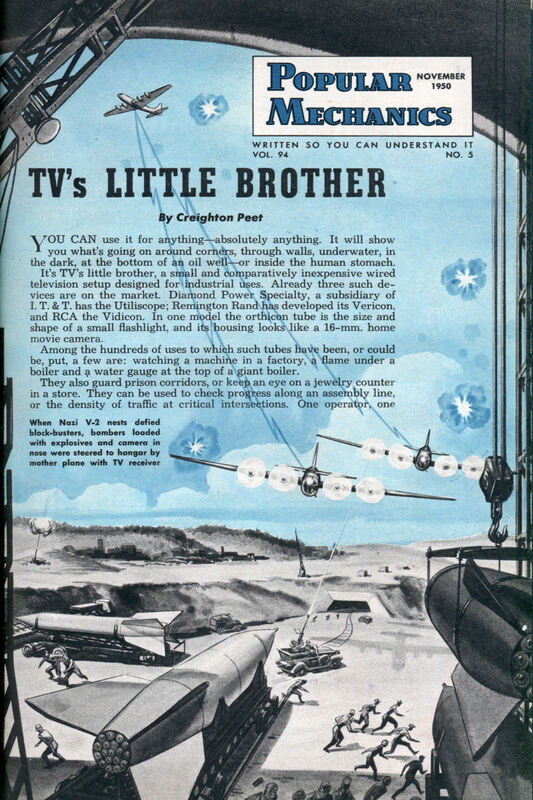 The present development of wired, industrial television was of course inevitable, but long before millions of people were watching Milton Berle in their homes, both the Navy and the Air Force had experimented with both planes and weapons equipped with television. In one form tested at Lake Muroc, Calif., a TV transmitter was mounted in the nose of a bomb equipped with small fins, or wings. The tail assembly held a steering mechanism operated by radio from the control plane. Watching the drop in a receiving set in the plane, the bombardier could correct his drop by changing the pitch of the fins on the bomb as it fell. The difficulty with this was that these changes of direction could be achieved for only the first few seconds after the bomb had left the plane. As its velocity increased, changing the pitch of the fins had almost no effect. Colonel Norvell, who was involved in this experimental work, recalls the horrifying experience of getting a bomb’s-eye view of himself. In addition to the receiver in the control plane, another was set up in a shack in the desert not far from the bombing range. As the TV-equipped bomb ripped through the air, Norvell and his fellow officers could distinctly see the shack in which they were huddled grow larger and larger as the bomb came nearer the earth. Fortunately, the bombardier’s aim was good and they were unhurt. Stationed in England at the time the V-2 rockets were at their worst, Colonel Norvell was assigned the job of bombing the supply hangars in which the Nazis assembled and stored them. However, the roofs on these hangars were of reinforced concrete so thick that even blockbusters failed to open them up. So Norvell equipped 34 bombers. B-17s and B-24s, with automatic pilots and loaded each one with 2400 pounds of TNT and Torpex. In the nose of each plane was a TV camera, and high over the Channel, in the Calais area, was a control plane with a TV receiver. The object was to fly these bombers, one at a time, right into the gaping mouths of the V-2 hangars, through which the rockets were brought before firing. In order to follow the picture picked up by the cameras in these bombers, they were set to fly as slowly as possible. The openings to the hangars were not too large, and it was necessary to be very accurate. Consequently, many of them were hit by A A fire before they reached their objectivesâ€”but a fair number were successful â€”and this was the beginning of the end of the V-2s. In recent months, the Army Signal Corps held a public demonstration in Fort Monmouth, N. J., of still another TV application. The camera was mounted in a small, low-flying reconnaissance plane, which sent back a picture to its ground base. The V-2 story is pure hogwash! Shows guy in skivvies with a shotgun. I loved this article … The most fascinating thing about most of these articles is the wonder over things we all take for granted today. But a significant side-benefit for me are the ads that show up on some of the scanned pages. The one on the last page of this one, for the Atlastic underwear, is priceless … he looks VERY happy, but I suppose I would too if I was bowling in my underwear. And I note they were good enough to point out the “vital points” for us.